Skills and abilities: Practices a freestyle version of Capoiera, but relies heavily on his enhanced abilities to compensate for his current lack of skill. Powers: Enhanced-strength (2 tons), Speed, Agility, Reflexes, Senses, Balance, Healing and Durability. Retractable cat-like claws on all fingers and toes, gives off a high pheromone scent. Gavin Shaw is a young high school senior living in Apollo Bay, one of the toughest cities in California. Gavin’s greatest desire was to find a way to do what the police has never been capable of doing…Release the strangle hold the gangs and drug dealers have on his home town. On his way home from tutoring a friend, Gavin stumbles across the hero known as Lionsblood who had been badly injured in an alley. Quickly running to the hero’s aid, Gavin unknowing placed himself in the line of fire of the very supervillian who, moments ago, had injured the hero he was trying to save and in that instant suffered a mortal wound himself. Surprised that he was even still alive, Gavin awoke the next morning in a hospital bed. The teenager would soon discover that Lionsblood, in an effort to save the boy’s life, had to inject him with the same serum that gave the hero his powers. 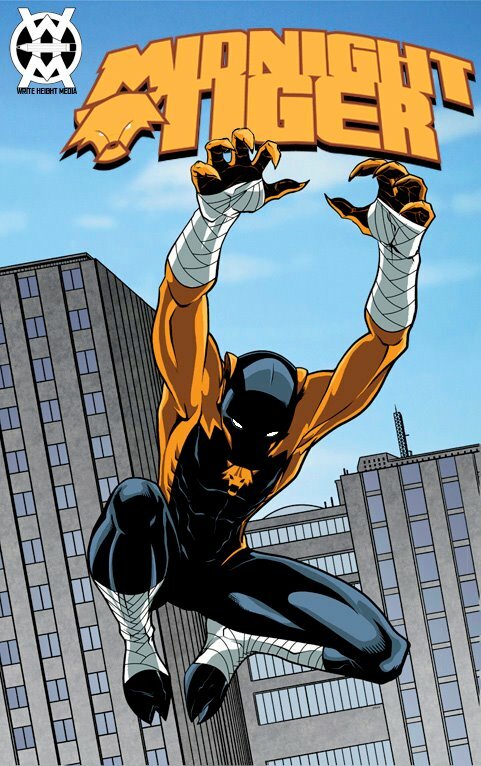 Finally having the means to do something and wanting to put his new found abilities to good use, Gavin becomes the crime-fighter known as Midnight Tiger and begins his assault on the gangs and drug dealers of Apollo Bay. Soon, he began to catch the attention of major criminals who he knew he couldn’t take down alone. This prompted him to seek membership into the ICONS Project. A government sanctioned superhero team spearheaded by former superhero turned cop Lt. Grant Goodrich and composed of young, moderately experienced heroes who step in when the local authorities aren’t enough. Though lacking the experience required, Gavin is determined to join the ranks of the newly reinstated ICONS and become one of the greatest heroes ever known. I’ve ordered this yesterday. Keep hearing good things about it. I’ve read the first issue and will be posting the review later this week along with Dusu! I think both are worthy of Hype! i wont tot read this can i get a d-download? Looks neat. Where does one buy it? And any Latino heroes coming?